A giant of the game in more ways than one, Johnson is widely regarded as one of the greatest locks to have ever played the game. As a player he famously led England to glory at the 2003 Rugby World Cup and also captained the British & Irish Lions in 1997 and 2001 - the only player to have ever led the elite tourists on two occasions. In a glittering career Johnson was also part of two Grand Slam-winning England sides in 1995 and again as captain in 2003. He is currently the England team manager having been handed control of the national side in April 2008 despite having no previous coaching experience. 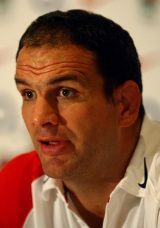 Johnson began his international career against France in the 1993 Five Nations Championship and called time on his England career shortly after his side's memorable Rugby World Cup triumph in Australia. An inspirational leader for club and country, only Jason Leonard and Rory Underwood have pulled on an England shirt more times while Will Carling is the only captain to have led England on more occasions. On the domestic stage he played all his club rugby for Leicester Tigers, making his debut in 1989 before going on to make a total of 307 appearances before hanging up his boots in 2005. During his 16-year career at Welford Road he led them to back-to-back Heineken Cup titles in 2001 and 2002 and also five Premiership titles including four in-a-row between 1998-99 and 2001-02. Johnson's development was handed a timely boost when in 1989 he caught the eye of All Blacks legend Colin Meads who invited the raw but promising teenager to New Zealand to play for the King Country province. Johnson took up the offer and would go on to be capped by New Zealand U21s. He returned to the UK in 1990 and his international bow followed in 1993 when England coach Geoff Cooke called him up as a late replacement for the injured Wade Dooley. Thrown straight into the starting line-up, the lock held his own as England notched a narrow 16-15 victory. He was subsequently called up to the 1993 Lions tour to New Zealand as a replacement and featured in two Tests. England secured the Grand Slam and a fourth place finish at the Rugby World Cup in 1995 with Johnson at the heart of both campaigns and another Five Nations title followed in 1996. His leadership potential was identified by Lions coach Ian McGeechan who handed him the honour of leading the tourists to the home of the then world champions - South Africa. It was here that Johnson's reputation took a big step towards legendary status as he steered the Lions to an historic 2-1 series triumph. Following Lawrence Dallaglio's brush with the tabloids in 1999, Johnson was given the captaincy of England by coach Clive Woodward and the duo would lead England through their most successful period ever. Six Nations titles followed in 2000 and 2001 and there was little argument as Lions coach Ian McGeechan once again turned to Johnson to lead his squad to Australia. This time the Lions were edged out 2-1 in an entertaining and thrilling Test series. It was 2003 that proved to be the pivotal year not only in Johnson's career but in the history of English rugby with the inspirational lock leading from the front. First came the elusive Six Nations Grand Slam - sealed with a thumping victory over Ireland at Lansdowne Road. It was on this occasion that Johnson illustrated his no-nonsense approach to the game and a propensity for run-ins with rugby authorities. Johnson broke with protocol ahead of the anthems by lining his side up on the right hand side of the red carpet and refused to move his side when requested to do so by Irish match officials. In response Ireland lined up on the right hand side of the England team and as a result Irish President Mary McAleese was forced to forsake the red carpet and walk on the muddy pitch to meet home-grown heroes. Their Championship success was followed by a morale-boosting trip to the southern hemisphere where they recorded back-to-back wins over New Zealand and Australia. Notably in the hard-fought win over the All Blacks in Wellington, England produced a superb defensive display to deny the hosts despite having two players in the sin-bin. England produced arguably the best performance of modern times to account for the Wallabies the following weekend. England entered the Rugby World Cup in Australia later that year as joint favourites with New Zealand and although thanks largely to Johnson's leadership and boot of flyhalf Jonny Wilkinson they notched key victories over South Africa, Wales and France before beating the hosts in a memorable final. As a result Johnson became the first Englishman to lift the Webb Ellis Cup and he led his victorious side back to England where they received a hero's welcome and were honored with a victory parade through the heart of London. Johnson ended speculation regarding his international future by announcing his retirement in January 2004. His rise to prominence on the club stage coincided with a period of domestic dominance for the Tigers. With one league title on his CV already, he was handed the captaincy of the side in 1997 and led them on a glory march that encompassed four successive Premiership titles between 1999 and 2002. This period also saw the Tigers win back-to-back Heineken Cup titles in 2001 and 2002. He finally bowed out with defeat against London Wasps in the 2005 Premiership Final at Twickenham. Johnson's testimonial match was staged at Twickenham in 2005 and he returned to England's HQ for the Help for Heroes charity clash in 2008. Johnson took charge of the England team on April 16, 2008, having secured a deal until December 31, 2011. And he led the national side into the 2009 Six Nations where they finished second in the tournament but suffered defeats against Wales and Ireland. Their Six Nations fortunes showed little sign of improving the following year as they finished third with losses to Ireland and France. But in the summer of 2010, England claimed the scalp of Australia in Sydney on June 19 as they overcame the Wallabies 21-20. This performance was backed up with an impressive showing at Twickenham against the Wallabies as England prevailed 35-18 thanks to a wonder try from Chris Ashton. Going into the 2011 Six Nations, Johnson's England looked primed to impress and they seemingly realised their potential with wins over Wales, Italy, France and Scotland. Their Grand Slam dreams were dashed when perennial rivals Ireland overcame England at the Aviva Stadium. England warmed up for the 2011 World Cup with a win at home against Wales but came undone a week later at the Millennium Stadium. But they finished their warm-up schedule with an impressive win at the Aviva Stadium against Ireland. But going into the 2011 World Cup, England failed to hit the heights shown during the 2011 Six Nations. England were unconvincing against Argentina in their tournament opener winning narrowly 13-9. It was then that rumours started circulating in the press of England's discipline faltering off the pitch. England centre Mike Tindall was on the front-pages of the tabloids with a number of England players caught in a Queenstown nightclub. And things got worse for England with Courtney Lawes banned and unconvincing performances - despite eventually running out with an impressive winning margin - against Georgia and Romania. Following the win over Romania, two of England's coaches were banned for 'ball tampering' - another scandal to hit England's World Cup campaign. Going into the final match of the pool stage against Scotland, their Auld Enemies were under pressure following a loss to the Pumas. England ran out 16-12 winners but it was another unconvincing performance. On October 8th, England crashed out of the World Cup with a 19-12 defeat to France. Johnson faced criticism from the media for his selection of Toby Flood and Jonny Wilkinson in the midfield but refused to comment on his future following England's early World Cup exit. On November 16 - following weeks of speculation -Johnson resignsed as England team manager with a record of 21 wins, 16 defeats and one draw. Johnson was awarded an OBE by The Queen in 1997, he was later honoured with a CBE in the aftermath of England's Rugby World Cup triumph in 2003.